SYNOPSIS: In "The International," a gripping thriller, Interpol Agent Louis Salinger (Clive Owen) and Manhattan Assistant District Attorney Eleanor Whitman (Naomi Watts) are determined to bring to justice one of the world's most powerful banks. Uncovering myriad and reprehensible illegal activities, Salinger and Whitman follow the money from Berlin to Milan to New York to Istanbul. Finding themselves in a high-stakes chase across the globe, their relentless tenacity puts their own lives at risk as their targets will stop at nothing – even murder – to continue financing terror and war. REVIEW: “You control the debt, you control everything.” Remember this line if you decide to go see this movie. It almost summarizes the whole thing. Well, no, not really, because actually it doesn’t matter much towards the end of the film. It is just a means to an end. This film has a slice of really good action, a slice of good drama, a slice of heavy suspense, a slice of intelligent thriller, plus a slice of mystery and if you put it all together you have a movie with an identity crisis. It was okay, but not as good as I was hoping. It did have its nerve racking scenes but it also had some slow ones that will make you anxious, or even bored. 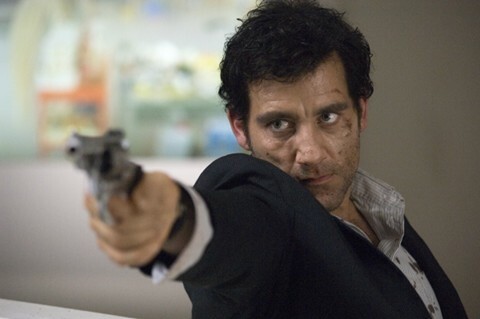 I just realized after watching this movie that Clive Owen is masterful at being monotone with both his speech and his stare (sorry, I can be a little slow with picking up on things). This is not necessarily a bad thing. It could add to the dramatic effect of the character. He plays Louis Salinger, a paranoid Interpol agent looking for justice in all the wrong places. It is hard to say that he made the movie worthwhile, but you can definitely say that this movie requires a big name playing the lead role in order to help with its success. The co-star of the picture, Naomi Watts, plays Eleanor Whitman, a Manhattan Assistant District Attorney. Sadly, other than getting banged up, she doesn’t contribute a whole lot to this film. It makes even less sense that she, a District Attorney, would be trekking around the globe with an Interpol agent trying to solve the case. Armin Mueller-Stahl plays Wilhelm Wexler, one of the bank executives, and he delivers another chilling performance as he does so well. The story deals with a large banks involvement in organized crime, murder, arms dealing, terrorism, and war and the relentless determination to cover up at any cost. At one point in the film it is brushed off as a necessary evil, similar to how it is presented in Lord of War, the Nick Cage flick. But Lou Salinger is just as determined to bring this organization to justice. The investigation takes him all around Europe and New York and the consequential cinematography is very well done. There is a scene that takes place in the Guggenheim Museum in New York that will put you on the edge of your seat and slap you around a bit. Just when you’re about to think the movie is a bore, BAM! It is intense action, don’t blink, and watch out for stray bullets kind of stuff. Whew! It does add points to the movie. Unfortunately, after a scene like that, the climax that came afterward was a little less climactic. Overall, the story did have an interesting concept and had the right intentions, but the delivery was weak. Regardless, Director Tom Tykwer does show his talent because the movie is well made and well shot, it’s just that it has its weaknesses.